Port Louis is the largest city and capital of the small island nation Mauritius, which is located in the southwest Indian Ocean. The city had a population of 148,416 people in 2010. Port Louis, located on the northwest coast of the main island, is an important financial services center and tourist destination. Due to tourism and a manufacturing economy based around the port, which includes the production of chemicals, textiles, plastics, and pharmaceuticals, Port Louis is one of the most prosperous African cities. The history of Port Louis goes back to its founding and settling in the 17th century by Dutch mariners who named it Noordt Wester Haven. In 1736 the French took control of the island and renamed the city after French King Louis XV. The French used Port Louis as a port of call for ships that, on their passage between Asia and Europe, needed to go around the Cape of Good Hope in South Africa. The island was also used for sugar production. Enslaved people, imported from Madagascar, were summoned to work on the sugar plantations. Because Port Louis was a strategic point for controlling the Indian Ocean, the British occupied Mauritius during the Napoleonic Wars between 1800 and 1815. After the British abolished slavery in 1833 they imported indentured servants from India to work on the sugar fields. When the Suez Canal opened in Egypt in 1869, Port Louis was bypassed by the new Europe-Asia shipping route. Conflict in the Middle East closed the Canal between 1967 and 1975, at which time Port Louis again became important in promoting the modernization of the harbor. Mauritius gained its independence from the United Kingdom in 1968, and Port Louis became the capital city. The city of Port Louis has faced a number of natural disasters: Between 1773 and 1892 the city was plagued by a series of fires and tropical storms; in 1819 a cholera epidemic killed an estimated 700 Port Louis citizens; 3,700 people died during a malaria outbreak in 1866; and in 1892 a cyclone destroyed 3,000 homes. Many landmarks in Port Louis showcase the city’s diversity of cultures. Aapravasi Ghat, a UNESCO World Heritage Site, was the landing point of indentured servants from India in the 19th century. Other sites include the St. Louis Cathedral, the Jummah Masjid mosque, the Chinatown District, the Mauritius National History Museum, and the Blue Penny Museum. Port Louis’s racetrack, founded in 1812, is still in business, and Le Caudan Waterfront, opened in 1996, features many casinos, restaurants, and shops. 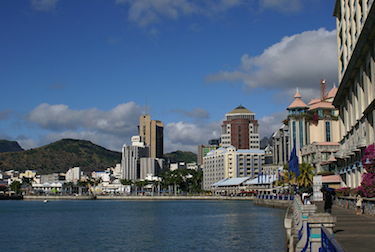 About 75% of the population of Port Louis today is of Indian descent, while other ethnicities include people of African, Chinese, and Eurasian background. Mauritian Creoles, people who are a mixture of these groups, constitute another minority group in Port Louis. English is the official language of the government, but French is also spoken and taught in schools. Those who practice Hinduism account for 50% of population, Roman Catholics are another 25% and Muslims comprise 17%. The rest of the people belong to Protestant Christian denominations or other religious or secular groups. Roman A. Cybriwsky, "Port Louis," Capital Cities around the World: An Encyclopedia of Geography, History, and Culture. (Santa Barbara, California: ABC-CLIO, 2013); "Port Louis," Encyclopedia Britannica Online, http://www.britannica.com/EBchecked/topic/470911/Port-Louis; “History of Port Louis,” Lonely Planet, http://www.lonelyplanet.com/mauritius/port-louis/history.